Welcome to my June 2017 Monthly Income Report! 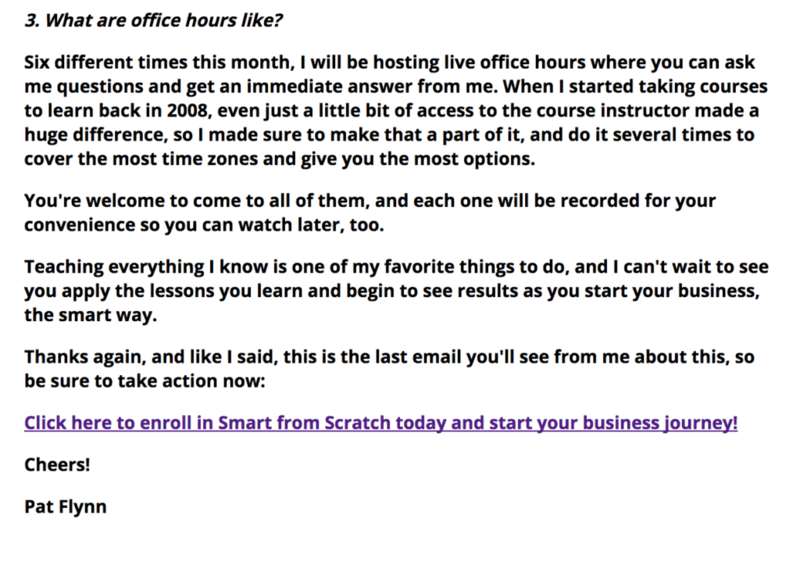 I’ve got a great one for you this month, as it includes earnings from my recent Smart From Scratch online course launch. But, as always, let me first share what these income reports are all about, for those who may be new. In October 2008, after generating an income online for the first time from my architecture-related business, I decided to share openly how much money I was making, and exactly how it all happened. Since then, I’ve been posting these reports monthly, which you can find here on my income report page. I do this not only to keep track and inspire others, but also as a way to teach lessons along the way. I’ll tell you this, though: I don’t know everything there is to know about online business. I’m always learning, but whether my income goes up, or it happens to go down (which it has several times), there’s always a lesson to take with you. My hope is that those of you who have started a business on your own, or who aspire to do so, can learn from my wins and my mistakes, so you can build your successful venture with confidence, and with me in your corner. Here’s to you and your success! And now, let’s get right into June 2017. June was a month I’ve been looking forward to for a very, very long time. 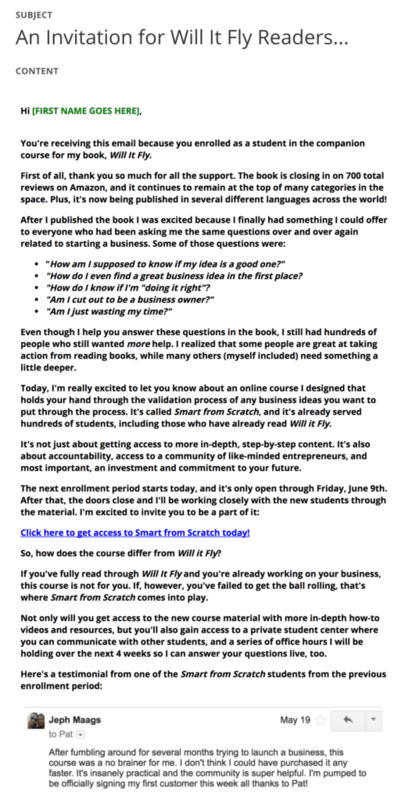 After months of planning, a beta test, and a soft launch, I was ready to finally go big and public with my new online course, Smart From Scratch, an online course I created to help those at the very beginning of their online business journey cut through the weeds to find and validate an idea that stands a chance to win. With several hundred students having already gone through the course, I was confident that if I put some force behind the promotion, it would perform very well. And it did! I’ll get to some of what worked in just a minute, but I just wanted to quickly share the numbers. Five days after the $197 course launched, it closed with $103,425 in total gross revenue. My first six-figure launch! And all of this without a joint-venture (JV) partner or affiliate involved, which means that minus the cost of fees and advertisements, it was nearly all profit. I was stoked! First of all, look at that last day! That accounted for almost half of the total sales. The pattern of sales across the week was exactly the same as the soft launch back in March of this year: about 20 percent on day one, a lull during the middle of the week, and then a mad rush at the end of the sale. Further, based on my rough calculations, of all of the sales on the final day, over 75 percent came within the last six hours of the cart being open. How crazy is that? There’s definitely a sense of FOMO (fear of missing out) involved. This is one of the pros of opening your carts for a short time period, and then closing them, which removes the opportunity to buy after a certain time period. People do not want to miss out, which is why evergreen funnels and promotions, ones in which the cart is open all of the time, are a little harder to inject scarcity into. That being said, I have heard of strategies for adding scarcity, even in an evergreen funnel. Tools like Deadline Funnel apparently work really well for this. Adding an expiring bonus or price increase helps too. There were a lot of moving parts here during this launch, but it was not a Product Launch Formula (PLF) style of launch, as many have come to expect with more traditional “internet marketing” launches. PLF launches are those with multiple (usually three) videos that lead into a big promotion, often with several affiliates and JVs on board to simultaneously push the product. There’s usually an affiliate contest between the JVs you may not even know about, pushing them to be even more aggressive with their bonuses and emails. Those kinds of launches are starting to be considered a little “old school,” and although they can work very well sometimes, it’s not a type of promotion I resonate with on the consumer end, so I don’t promote my own products that way either. Email played a huge role in the launch of this course, because I knew exactly who this course was for, and my email segmentation strategies helped me make sure only those people saw the offer. If you’re on my list and you did not see this offer, it’s because you’ve indicated to me, through a click or certain action, that you already have a business, so the course wouldn’t be relevant to you. On the other hand, those who specifically told me (or signaled to me) that they did not have a business saw multiple instances of the offer through email. 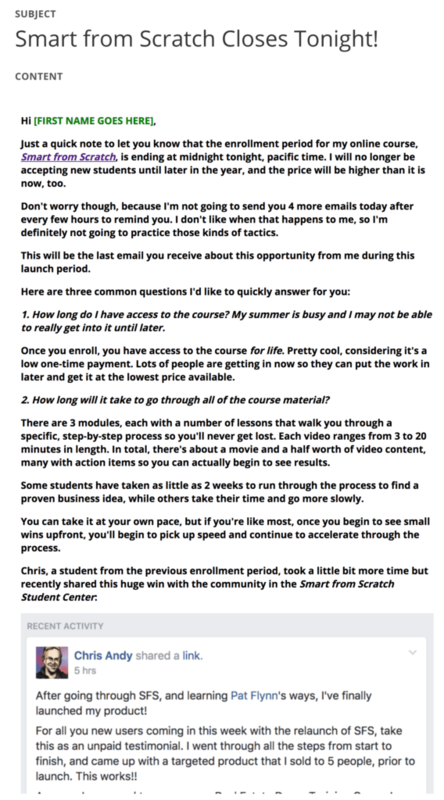 Those who had signed up for the waitlist on SmartFromScratch.com (about 3,000 people). Those who clicked “I have yet to start a business of my own” in an email that I sent out to those who join my email list (about 33,000 people). Those who have signed up as a student in my Will It Fly? book companion course, a free course that comes with my book about validating business ideas. To each of these segments, even my announcement emails were different. And rightly so. And this makes sense, right? They know what’s coming, they’ve been warmed up. Don’t add any more fluff. Just get those who are on the waitlist to take action. 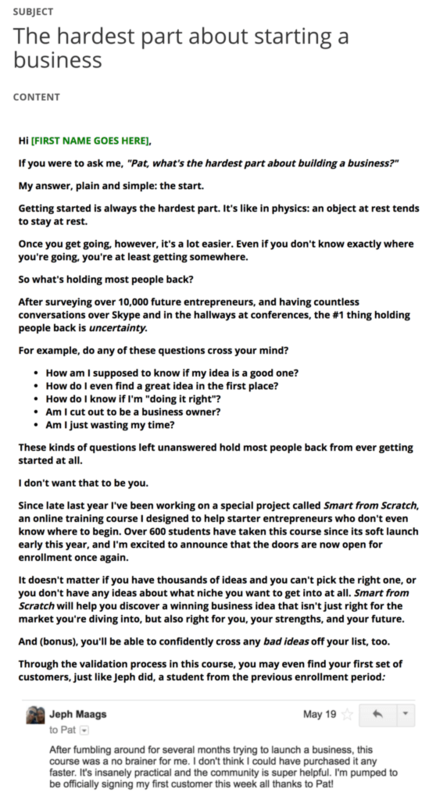 For those who were marked as “no business yet” on my email list, I sent them this email, which helped to connect their desire to start a business with the solution: the course. As you can see here, I also included a testimonial from one of the students. Although I don’t typically recommend adding images to emails, I thought it was important to include here to add credibility to the course. Also, it helps to break up the large amount of content. Yes, this is quite long for an email announcement, but it addresses some of the most important topics, such as the price. 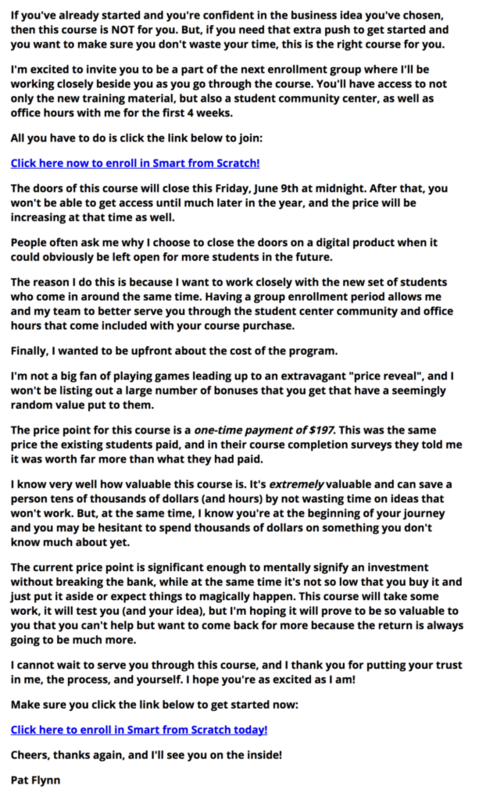 I got a lot of comments about how I framed the price point here, which I felt had to be done because all of these potential customers are beginners, and are less likely to have spent money online, or have only had terrible experiences doing so (at least for other online courses). As you can see, I ran a split-test, utilizing ConvertKit’s algorithms to help determine which of the two subject lines would be seen the most. 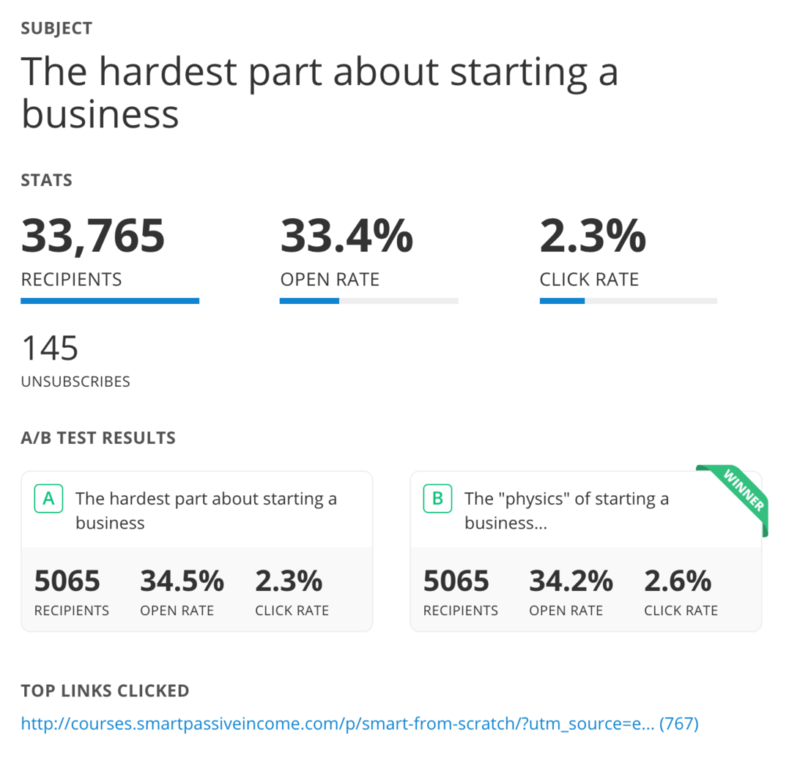 Both had the same open rate, interestingly enough, but it was “The ‘physics’ of starting a business…” subject line that won because of the higher click-through rate. It’s not that significant of a difference, so this split-test I’d actually call a draw. It was my first time using ConvertKit’s new split-test feature though, and I must say, I like how easy and automatic it is. And finally, the last group I was really selling to were the students of my Will It Fly? Companion Course, which readers of my book use to access bonus material. The tricky part about promoting to this group is this: the book itself runs through the same structure as that in the course. The course is a more enhanced version of the book (deeper in content, but also with a student center and office hours), so my job here is not only to let these people know about the new course, but also how it differs from the book itself. As you can see, there’s a section specifically addressing the differences in the book and in the course. I also included that same testimonial as I did in the email before, and I close the exact same way as well, so I won’t include the ending of that email here again. 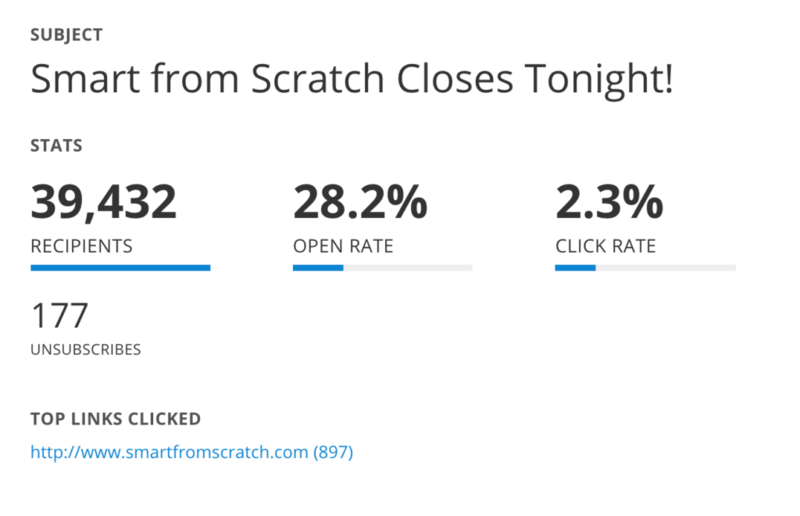 A much higher open and click-through rate. It goes to show you that even though you might write a book about a topic, a certain amount of readers will definitely want to go deeper with you, either because they need more information, or because they like you enough (or both). Have a book already? Have you considered creating a course to go along with it, using the same content, just more in-depth? Something to think about. Anyway, that set off the fireworks for the rest of the week. Thankfully, there were no software meltdowns or glitches to worry about (like during the soft launch in March when Amazon Web Services decided to die during the launch period, hehe). There’s another screenshot from a successful student! I address questions that are likely in people’s heads, and even if they aren’t, they plant “good vibes” to those who may be on the fence. For example, the fact that they’ll have lifetime access to the course and can fit it in whenever they can. Also, a glimpse into what office hours are like. Beyond email though, a lot more was happening behind the scenes. For example, I went LIVE on Facebook several times during the week to answer questions, to be present, and give people another touchpoint related to the course. I was also using social media, using image cards on Twitter, Facebook, and LinkedIn to promote. The green highlights on the left hand side were things that my team had to either design and or schedule, mainly for social media purposes. 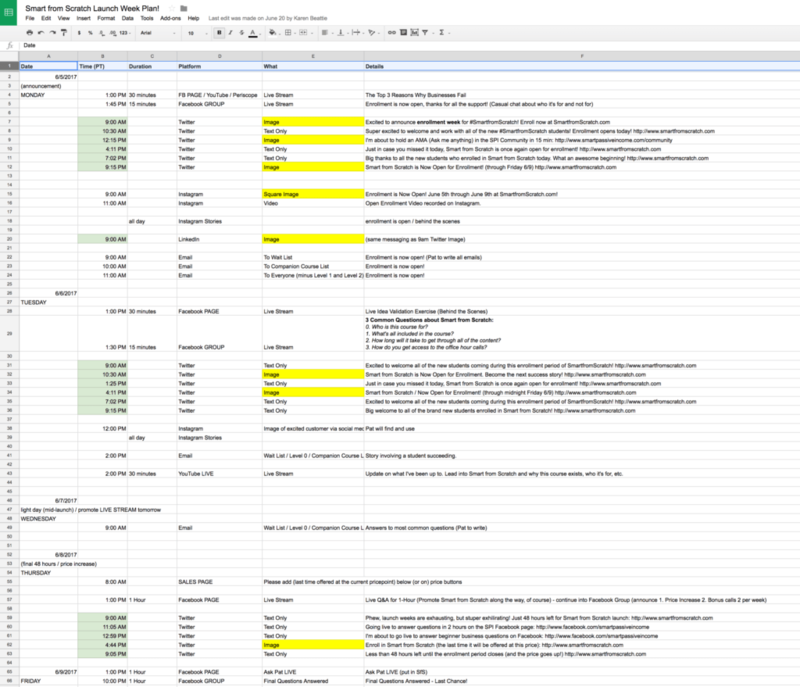 There’s a lot of stuff happening here, as you can see, but when it’s all laid out like this, it makes it super easy for my team and me to stay on top of the entire launch plan. How long did it take to set up this entire document? I’m glad you asked, because I timed it for you. This took me a total of 2 hours and 39 minutes to complete, from start to finish. It took two sittings on two separate days, but once it was done, it helped out so much. Taking a little bit of time to plan ahead for something like this is huge, and I highly recommend it. The launch was the biggest thing to happen in June, so I won’t be going into much more that happened during the month before we get into the income breakdown. The only other big piece of news was this: June means the kids are off school, and so after the launch was over, beyond the office hours that were scheduled during the month, most of my time was spent celebrating the summer with the family. That means a lot of pool time, park time, and reading time. I hope you’re enjoying your summer thus far too! I have one more behind-the-scenes launch related promotional effort I’d like to share with you, but I’ll save that for after the income breakdown, which you’ll see below. Some of the items in the list below are affiliate links, which means that if you choose to make a purchase through that link, I will earn a commission. This commission comes at no additional cost to you. Please understand that I have experience with all of these companies, and I recommend them because they are helpful and useful, not because of the small commissions I make if you decide to buy something. Please do not spend any money on these products unless you feel you need them or that they will help you achieve your goals. Note: Items with an empty difference percentage were not present on the previous month’s income report. 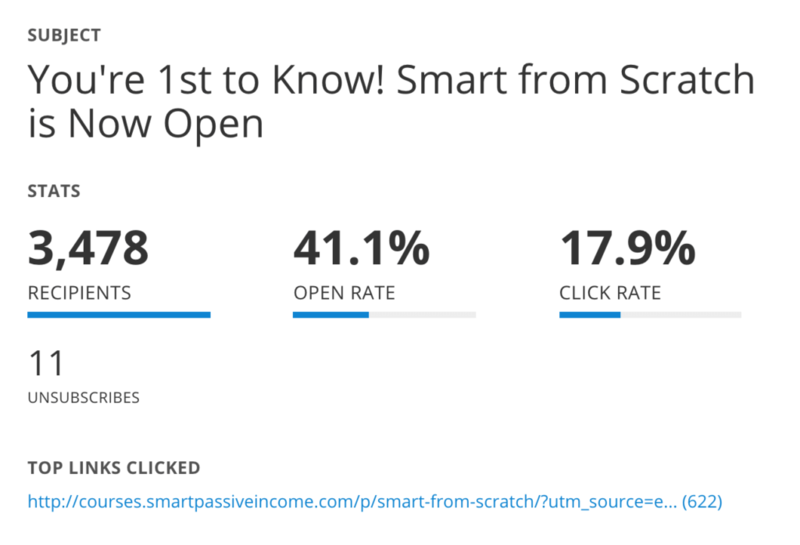 Obviously, the launch for Smart From Scratch was the biggest money-maker in June. I’m looking forward to July as well because on July 17 I’m opening the doors to my new course, coming out of its beta-launch and into the public for the first time, Power-Up Podcasting. Make sure to sign up for that waitlist (click here to be first to know on July 17!) if you’re interested in not only getting your podcast set up and running quickly, but also how to launch and market your show so it will be found and your message will be heard. That’s my specialty, and I’m excited to help even more people in the world of podcasting very soon. As I mentioned earlier, I had one more trick up my sleeve when it came to this previous launch, and it wasn’t really a trick at all. It’s something that many other people know better than me, and I’m only now finally diving into that world, because I finally have my own products to sell. Yup! I finally began to run ads for something with conversions in mind. I had some help, and after a few more trials I’ll be sure to share more information about that help very soon, but all in all, it was a major success. The challenge, I’m told, was that because it was such a short window for a launch period (five days), Facebook didn’t have enough time to really get to the lower numbers in terms of cost-per-lead. 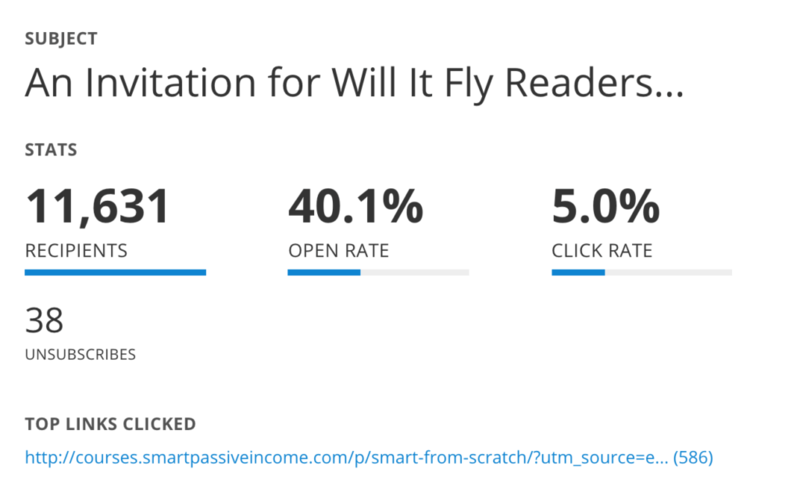 When this becomes part of an evergreen funnel, it could potentially do extremely well as the ads and targeting would continually be fine-tuned. In total, I spent $6,928.17 in advertising dollars, and those dollars specifically brought back a total of $39,991.00 in sales. It’s hard to tell whether or not some of those sales would have come in anyway without the Facebook advertising, as we were retargeting and placing ads in front of those who already knew about me, but I’d gladly trade $7k to earn $40k like this any day. I’m learning more about Facebook advertising as I go along, but it is nice to get some help and guidance along the way. A big thanks to everyone who contributed in May on the blog and podcast during Paid Advertising Month, where I not only asked for guest posts and interviews on the podcast for your benefit, but for my own as well. Here’s to another successful month, and wishing you all the best. We’re over half-way through the year, so if you have yet to move forward to achieve your goals, now is the time! And if podcasting is a part of that vision, please make sure to sign up for the waitlist at PowerUpPodcasting.com, and look out for the July 17 open enrollment announcement! Cheers everyone, and thanks so much for your support! Oh, and since we’re coming up to event season, here’s list of where I’ll be speaking at very soon. Hope to see you there!